China is one of the largest potential markets for CAN users. 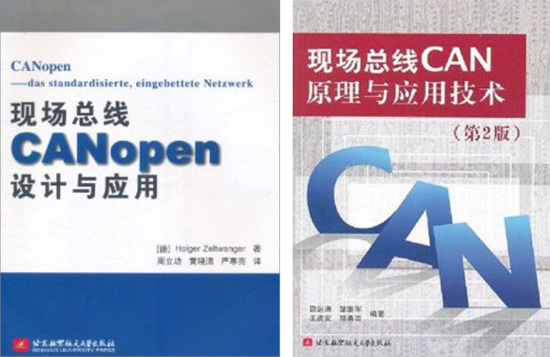 However, many of the Chinese development engineers prefer to read basic information about the CAN protocol and the CAN system design in Chinese language. This is why several books about CAN technology have been published. Some of them are just collections of articles and information from chip suppliers and general information available on the Internet. The CANopen book is a translation from the 2nd edition of the German original. But also this book is an edited collection of articles from different authors. Some books have been released a couple of years ago (the oldest is from 1996). Some of them are not more available in bookshops. Therefore, the following summary is not complete. Li Chen and Cui Jian: Introduction and practice of CAN. Beihang University Press, Beijing 2011. ISBN 978-7-5124-0268-3. The 242-pages paperback book comprises an introduction into the CAN data link layer protocol in detail. Standardized higher-layer protocols like CANopen, DeviceNet, and J1939 are just mentioned briefly. A huge part of the book describes the NXP products (transceiver chips and CAN controllers) in details. Holger Zeltwanger (publisher): CANopen. Beihang University Press, Beijing 2011. ISBN 978-7-5124-0486-1. The 213-pages paperback book provides an introduction to the CAN lower-layers and describes the CANopen application layer in details. In addition, several authors give an overview of the standardized CANopen device and application profiles. ZLG (publisher): iCAN field-bus and applications. Beihang University Press, Beijing 2007. ISBN 978-7-81077-975-3. The 410-pages paperback book describes the CAN lower layers and the proprietary iCAN higher-layer protocol by ZLG. It also contains detailed product descriptions of the I/O modules and PC interfaces cards.